A personalised wooden tag is a lovely way to finish off a gift for a special princess. It adds a lovely touch to the gift and can be kept as a keepsake after the gift has been unwrapped and take pride of place in her bedroom. 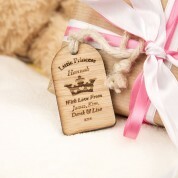 We laser engrave each tag in house with the personalisation details so they are custom made for your princess. As wood is a natural and beautiful product and the grains vary from tree to tree, each tag is uinque but they still have the rustic appeal as they are laser cut in house.